Albacore Tuna Loins Super Frozen Skinless, boneless, bloodline out, belly off Super Frozen, Sashimi Grade Double Vac-Pack Approximately 1 kg per piece 10-11 pieces per 10 kg styrofoam boxes 10 MT per 40' FCL. We have very competitive price for an excellent quality product. Short on time? Let albacore sellers contact you. Histamine bellow 50PPM, Mercury less than 0.5PPM, cadmium less than 0.1ppm lead: less than 0.4PPM. Standard: 25MT, with pallet. Moistures & impurities 0.72% Free fatty acid oleic-116.98 Lodine value 12.7% Saponification value 256. Drums or flexibags. Fishmeal, copra meal, copra cake, banana meal, rice bran, soya meal, coconut acid oil, crude glycerine, palm oil, banana cavendish, CFAD, used oil, sludge. Fishmeal, banana meal, copra meal, banana cavendish, coco acid oil, palm oil, CNO, substock, crude glycerin, porcine meal, crude oil, CFAD, bio diesel. Fish meal, banana meal, copra cake, copra expeller, banana cavendish, palm oil, crude glycerine, acid oil, coconut acid distillate, CNO, substock, bunker fuel. Palm acid oil, coconut oil, coconut fatty acid distillate, soya, crude glycerine, coco coir, soap stock, used coconut oil, rbd, porcine meal, fishmeal. Yellowfin, bigeye tuna, bluefin and albacore. 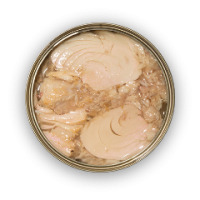 Canned tuna Principally, our customer relationships are characterised as being, long term, and trusted, both working to grow a strong mutual business. With the highest manufacturing and quality standards and a well-based understanding of most countries standards, and import requirements, we are able to provide to our customers the product and service they rightfully demand. From the america and greater europe to africa, middle east and the asia pacific region, there are relatively few markets in the world we do not currently supply. With trading offices in australia and new zealand, and strong agency relationships in other key regions, we are committed to provide a high level of service to our top quality Products and proven new product development capability. We pack a number of tuna mainly from imported fish. These are skipjack, yellowfin, albacore, and bigeye. Packing can be in the established styles of; Vegetable oil, brine, mineral water, sunflower oil, tuna sandwich in oil and brine, mayonnaise, dressing Sauce, tomato sauce, lemon & pepper, salsa mexicana, smoked, salad or as per customer's requirement. 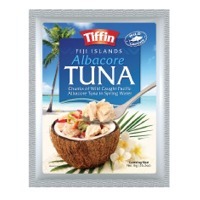 Description; Tuna - flakes, shredded, chunks, sliced, solid, sandwich spread, salad in mayonnaise Our standard packing size; Tuna solid and chunks nw.80, 100, 170, 185, 200, 340, 400, 425, 800, 1000, 1705 and 1885g. Tuna shredded and flake nw. 100, 170, 185g. Mackerel and sardines nw. 155, 200, 425, 125-130, 80, 215g. Value added nw.158g. Yellow fin, albacore, skip jack, tuna. Jast frozen tuna, albacor, local fish from spacific. Marlin, albacore, wahoo, tuna, dusky perch sword fish.